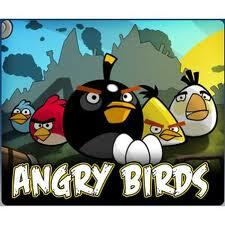 Why do adults like Angry Birds? I’m not sure, but since I recently started playing I had to stop and ponder my growing addiction. Let me start from the beginning. My precious 3-year old grandson, (yes, he’s three) was too busy to come to the phone and say hello to me. Since I don’t see him every day, I look forward to our daily chats. I know, what you’re thinking. Deep. That’s why I hate to miss a conversation! Anyway, one day he didn’t want to take the phone. My daughter said he was too busy. What could a 3-year old possibly do that was too busy to talk to his grandmother? Did he suddenly get a job? If that’s the case, I’ll retire. Then my daughter told me he was playing Angry Birds. A what?? I love my grandson beyond reason, but there was NO way I was going to be bested by a video game and not know what it is. (I consider myself an intermediate gamer. I love The Sims, any game by Rockstar—Red, Dead Redemption is my favorite) So, I went online (Google, of course) and I found everything I wanted to know about Angry Birds. Since I had my NOOK, (My iPad hadn’t come home just then) I downloaded the app and began playing like a fiend. Seeing the blue birds burst into three and attack the pigs who stole their eggs, is my big move. I also enjoy seeing the black bird explode, like a time bomb. Exciting. The yellow bird’s speed when you tap his little furry body is also quite exhilarating to watch. “Angry Birds,” he asked. The excitement in his voice warmed my heart. I was so overjoyed to be sharing this moment with him. About two hours later, my doorbell rings. It’s my daughter and yes, my grandson! I’m so happy to see him. It’s rare that they visit on a weeknight. But my daughter had to run an errand and they stopped by on the way back home. I didn’t care. They were there! No, that was not an invitation for me to play with him, or to show him how much I’ve learned. But for him to have my NOOK so HE could play. Anyway, thanks to my grandson, I’m now addicted. Oh, and I just downloaded Angry Birds Seasons on my iPad! You know, just in case.